Begin your research on International Law with these prominent treatises and study aids. This well-regarded distillation of public international law begins with the sources of international legal authority outlined in Article 38 of the Statute of the International Court of Justice. It goes on to address the recognition of states, sovereignty, state responsibility, the protection of individuals and groups, and the common heritage of the sea and the environment. A comprehensive and authoritative examination of the development, sources, substance, and practice of international law. Includes chronological tables of cases and treaties cited as well as a helpful list of abbreviations and acronyms. The author, a 35-year veteran of the British Foreign Office, explains how practical issues of treaty interpretation are dealt with on a daily basis. In addition to extensive commentary on the Vienna Convention on the Law of Treaties, the book covers memoranda of understanding, and the effects of changed circumstances. Originally published in two volumes (on Peace and on War & Neutrality) more than a century ago, this is one of the most important and influential English-language treatises on International Law. The 9th edition consists of an updated and revised first volume on Peace. Second and third volumes are planned but not yet published. Multiple editions of Prof. Oppenheim's original two-volume set, published as International Law: A Treatise, are available in print on the third floor of the Williams Library (call number KZ3264 .I6). This introductory resource provides a concise overview of public international law, briefly describing its history and sources, as well as the institutions that create, interpret, and enforce the law, with special attention given to the International Court of Justice. It also covers major treaties, the customs that govern them, and procedures for resolving international disputes. Part of the popular Nutshell series, this concise introduction to public international law is accessible yet authoritative. 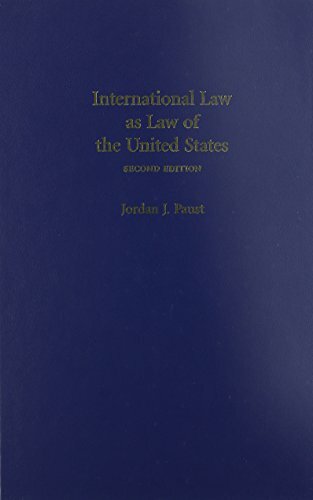 This book explores the uniquely American perspectives and constitutional issues that arise out of the interplay between international law and domestic law. This comprehensive historical work describes how international law has been formulated, debated, contested, and put into practice from ancient times to the present. This in-depth survey takes a comparative approach, analyzing how 19 states organize their treaty-making through national law and practice. Jurisdictions covered include Canada, China, Egypt, France, Germany, India, Israel, Japan, Mexico, Russia, South Africa, the United Kingdom, and the United States, among others. A comprehensive and authoritative summary of the American approach to international law and diplomacy and the role of international law in American jurisprudence. This guide sheds light on the rules and practices surrounding the making, interpretation, and operation of treaties and offers practical insights into how treaties actually work. Scholarly treatments are complimented by a set of model treaty clauses. Examples illustrate the approaches treaty-makers can take on topics such as entry into force, languages, reservations, and amendments. An excellent resources for understanding both the 1969 Vienna Convention on the Law of Treaties Between States and the 1986 Vienna Convention on the Law of Treaties Between States and International Organizations or Between International Organizations. This two-volume set includes the full text of each treaty, article-by-article commentary and interpretation, as well as the travaux preparatoires (preparatory works). This is Oxford's e-book version of the well-regarded print treatise with the same title. The work is a distillation of public international law begins with the sources of international legal authority outlined in Article 38 of the Statute of the International Court of Justice. It goes on to address the recognition of states, sovereignty, state responsibility, the protection of individuals and groups, and the common heritage of the sea and the environment. Oppenheim's International Law, Vol. 1 (Peace), 9th ed. Originally published in two volumes (on Peace and on War & Neutrality) more than a century ago, this is one of the most important and influential English-language treatises on International Law. The 9th edition consists of an updated and revised first volume on Peace. Multiple editions of Prof. Oppenheim's original two-volume set, published as International Law: A Treatise, are available in print on the third floor of the Williams Library (call number KZ3264 .I6). This e-book version of the print treatise with the same title is an in-depth survey takes a comparative approach, analyzing how 19 states organize their treaty-making through national law and practice. Jurisdictions covered include Canada, China, Egypt, France, Germany, India, Israel, Japan, Mexico, Russia, South Africa, the United Kingdom, and the United States, among others. Westlaw's electronic version of the print treatise with the same title. The work is a comprehensive and authoritative summary of the American approach to international law and diplomacy and the role of international law in American jurisprudence. This is HeinOnline's offering of a digitized version of the treatise's print edition. The work is comprehensive and authoritative summary of the American approach to international law and diplomacy and the role of international law in American jurisprudence. This is Oxford's e-book version of the print treatise with the same title. This guide sheds light on the rules and practices surrounding the making, interpretation, and operation of treaties and offers practical insights into how treaties actually work. Scholarly treatments are complimented by a set of model treaty clauses. Examples illustrate the approaches treaty-makers can take on topics such as entry into force, languages, reservations, and amendments. This is Oxford's e-book version of the two volume print treatise. It's an excellent resource for understanding both the 1969 Vienna Convention on the Law of Treaties Between States and the 1986 Vienna Convention on the Law of Treaties Between States and International Organizations or Between International Organizations. The work includes the full text of each treaty, article-by-article commentary and interpretation, as well as the travaux preparatoires (preparatory works).